For people who work with lots of Text files (txt) and have a requirement of converting txt files to PDF then Zilla TXT To PDF Converter is for them. 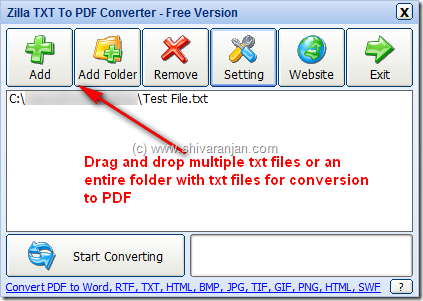 TXT to PDF Converter is free tool that can batch convert multiple text files (txt) files to PDF file quickly. To convert text files to PDF just drag and drop them and hit the ‘Start converting’ button to start the conversion process to PDF file. If you have a folder that contains txt files then drag and drop the folder and the entire txt files in that folder will be converted to PDF file. 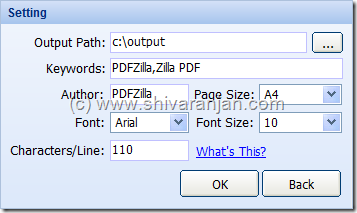 The output PDF file parameters like page size, font size, characters/line and author of PDF document can be controlled. This tool works with Windows XP, Windows Vista and Windows 7, as this tool does not require any installation hence can be used as a portable application in USB portable flash drives. having difficulties with your RSS. I don’t understand the reason why I can’t join it. hand on the small of my back outside tthe movie. fear of being accused of being a witch.